Atlas Welding & Fabrication, Inc. is a family owned and operated company that was founded in 1977. The company became known for fabricating miscellaneous and ornamental metals for installation. We pride ourselves that we’ve maintained that reputation over our 36 years in business. 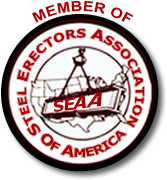 Over time we have grown and developed maintaining our reputation for quality while expanding our services into structural steel. Our company uses state of the art CNC machines from Peddinghaus to maintain the same quality in structural as we do in miscellaneous steel fabrication. We have implemented an in-house detailing department that uses SDS/2 software. Not only are we members of AISC, we have also maintained our Fabrication AND Erection certifications since 2009. If you are looking for quality work from start to finish than you need not look any further, please contact our office for a quote today! Copyright © 2019 Atlas Welding and Fabrication · Website by Shapiro Web Design.